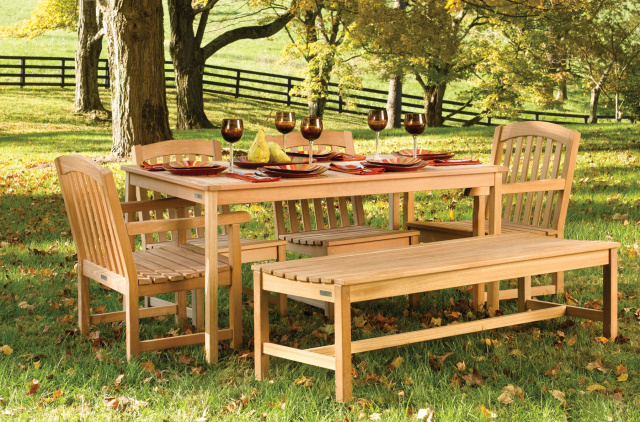 Teak hardwood is a popular choice for outdoor furniture. Not just because how nice its to have a set of outdoor furniture in your backyard, but also how people enjoy the advantages of Teak hardwood as their outdoor furniture material. Teak has always been a prized material. The tree that teak comes from, Tectona Grandis, is native to the tropics. Since around the 7th century, it has been used to outfit and adorn the residences of the wealthy and powerful. The wood's reputation made its way out of the region through the Dutch, who colonized Indonesia. They used the wood for shipbuilding, teak makes for an excellent ship wood due to its ability to ward off dry rot. Teak is found in Southeast Asian nations, but perhaps no central government takes its teak quite as seriously as Indonesia's. Since the country's post-colonial era began in the mid-20th century, the Indonesian government has had a corporation in place dedicated to managing one of the nation's most valuable natural resources. Here, a predetermined number of trees that can be felled each year. Each tree is replaced with a new one that's planted on the plantation. All of this makes teak a perfect material for outdoor furniture. As it weathers over time, the wood goes from a honey brown color to a slivery gray. Although teak is expensive, you can take the money you would have spent on annual waterproofing and apply it to buying outdoor teak furniture. Since teak is also an extremely durable and strong wood, a teak patio set owner can expect his or her purchase to last for many years. In caves in Western India, objects made from teak more than 2,000 years ago have been found intact -- astonishing for untreated, uncared for wood. This also offsets the initial costs of teak, especially once you consider furniture replacement costs. Teak wood has a very attractive looking straight grain pattern coupled with a rich golden-brown color. In addition to this teak wood furniture also feels great to the touch, when compared with many other woods used for outdoor furniture like Cedar, Pine, Fir, etc. The natural color and texture is already so great. You will enjoy looking at the natural lines on the wood and how the warm color make a perfect combination on your backyard. There are other hardwoods which are nearly as strong as teak, but it's mainly because of its beauty that teak wood is so popular all over the world. If you’re looking for an extravagant luxurious classic/historical type of garden furniture style, look no further than Teak types of garden furniture. To keep the original color, all you have to do is use Teak oil annually. Or, if you prefer, allow the color to change naturally over time. With so many finish choices, there is sure to be at least one shade and style to suit your garden furniture needs. Teak wood is a hardwood obtained from broad leaved deciduous trees, and it is exceptionally strong, not only when compared to softwoods such as Cedar wood or Pine wood, but also when compared with most of the other hardwood species of trees. Teak type hardwoods have many advantages over other materials used to make patio furniture. The first and most significant advantage is that Teak type hardwoods are a strong, durable, sustainable and beautiful hardwood from India, South America, Thailand & Malaysia. This exotic material was first used in the Middle Ages as a shipbuilding material, so it was well proven to be durable to endure the long voyages. With proper care, teak wood furniture lasts for many long years (in many cases over 100 years). This is the reason why we still find antique teak pieces around. If you wish to buy furniture that will serve you, your children and then your grandchildren, then the best option is to go for teak wood furniture. Durability can be counted as one of most significant advantage that teak wood offers. Being very strong, it will serve well when you invite many people at once. If you have large teak wood table along with the chairs, and all people are sitting there eating and maybe treating it wrong, it will stay strong. Teak wood has a natural oil content that resists termites (white ants), fungal stains, and also repels other insects that can destroy wood. Anyone who has ever had termites climbing on walls all over the house, and eating all the expensive wooden furniture before, will readily vouch for how important this benefit is. This termite and insect resisting quality in turn increases the life span of wood, and is the reason why teak wood is superior compared to many other wood species. Teak wood like all other solid wooden furniture moderates heat. What this means is that it does not become too hot or too cold in the hot summers or the cold winters even when exposed to the elements. Though most people do not explicitly notice this particular quality of wood, it is one of the reasons why people instinctively like the touch and feel of natural wood furniture compared to its plastic or metal counterparts. Teak wood has a very high density, and does not rot or decay easily. This is the reason why it is so durable. Teak wood also has a natural resistance to several alkaline and acidic substances. Hence it does not get spoiled or stained easily. Another important advantage of teak wood is that it has a good resistance to moisture and water. Other than its beauty, this is the reason why it is the preferred wood material used in ship-building for making the wooden flooring and decks. Because of its moisture resistance, teak wood is well suited for making indoor furniture as well as high quality garden furniture. After ships were decommissioned, the boats made with Teak material were still salvageable, since Teak did not rot or rust, even when joined with metal. This is one of the reasons that Teak is such a great material used to make garden furniture. So, if Teak could survive long trips on the harsh ocean, imagine how well it will stand up in your garden—without rusting or rotting! These waterproofing advantages are what make Teak type garden furniture an exceptional choice for your garden furniture. Teak wood is a very dense wood and has a high weight to volume ratio. This can be considered a beneficial trait, because a very basic rule in woodworking is that the denser and heavier a wood is, the stronger it will be. In addition to this most people have a distinct preference towards heavy and sturdy pieces of furniture, when it comes to buying solid wood furniture. As we also know it, teak wood is made of natural sources and is completely renewable unlike plastics and VOCs. It will not make you send bad contribution to the environment. The tree grows fast too so no land will be dull. Garden furniture can be extremely high maintenance. Some materials attract dirt and grime more than others – not Teak type hardwoods. They're very low maintenance, making Teak type hardwood garden furniture a great buy. With recent finishing, it is easy enough to clean it. Simple wiping is already enough. Stain will need more treatment using baking soda and warm water and that will be all. Since most people can’t afford to buy new garden furniture each year, another distinct advantage of Teak type garden furniture over garden furniture made from other materials is that it is extremely long-lasting. Teak garden furniture is so strong that it can stand the test of time (50-75 years), making it extremely cost-effective. Selling old teak furniture can be profitable. If you buy a teak furniture today and sell it after 15 years, you ought to still get a good price for it as long as you have taken care of it.